Everything to do with this film points to it as a phenomenal achievement. The challenge of adapting the dense Tolkien material for the big screen, making it visual and not literary and rendering it palatable to both Tolkienites and lay audiences is miraculous. The cinematic achievements made these films the high bar of technical cinema of their day. The special effects, which used a mixture of modern CGI and old fashioned camera sleight of hand, are clever and near seamless (though less so now). The consistency of tone, pace and visual design over these three films - from pre-production of the first film to post of the last film spanned 5 years - is remarkable. Hell, shooting three movies back-to-back-to-back was unheard of. So why am I left unmoved by any of these pictures? The experience of watching the entire Lord of the Rings saga is one of supreme admiration: 3 x 3 hours overloaded with every possible emotion, so many wondrous creatures and lands, so many sweeping epic landscapes trying really hard to take our breath away. For good and bad, Peter Jackson and his team, for the sake of satisfying the broadest possible audience, gave everybody a little bit of everything they wanted to see. And so he inevitably alienated and dissatisfied some. As for the first film, to bring people into the world of Tolkien, FOTR is by far the most baroque of the three. It doesn't take long to introduce the world and characters. The opening sequence tells us of the forging of a number of rings for the purpose of keeping order in the world (though it’s consciously oblique with the details of exactly how rings can do this). We’re then told about the ONE ring forged in ‘secret' to rule all other rings. Again, we're not supposed to question the physics/mechanics or even logic of this statement. And so this becomes literature’s - and now cinema’s - biggest ever maguffin, the impetus to send us on Jackson’s epic journey. The opening moments in the Hobbit Shire introducing Bilbo Baggins passing the ring off to Frodo are perhaps the best moments in the entire series. Ian Holm’s frightful and twitchy performance realizes a huge backstory of pain and suffering by the ring (a backstory which, of course, will likely be fleshed out by the new Hobbit films). In fact, the entire first half of Fellowship is spectacular. The horse riding ringwraiths, who resemble the evil ghosts in The Frighteners, are the scariest creatures in the whole series, but we unfortunately rarely get to see them in the latter half of the first film and the other two films. Weighing the film down is the lengthy Galadriel forest sequence, which is full of visual CG wonder and foreshadowing, but it's a slow uneventful section that only adds to the running time. The second half of the film shows the Fellowship united and fighting off the beasts in the Mines of Moria and the Orcs on the hillside in the film’s climax, as well as the eventual demise of Boromir, who succumbs to the lure of the ring. On first viewing I questioned the lack of scope in the final battle, but after seeing the escalation of action in the second and third films, Jackson’s instinct not to blow his wad early was a good one. In hindsight, the contained forest battle to end FOTR is perhaps the best action sequence in the series. Free of the grossly exaggerated CG multiplication of huge armies, which now looks awfully unreal, the use of real creatures and actors with real make-up makes the fight that much more violent and intense. Looking back, Wood and Astin make a good team as the Hobbit leaders mixing drama and humour well. Unfortunately, Billy Boyd is a Jar Jar-worthy waste of space and most of the time excruciating to watch. Dominic Monaghan is barely noticeable, which is probably a good thing (as an actor, he would be challenged much more in Lost). Orlando Bloom’s silent but stoic presence is also barely noticeable, but when he’s fighting and launching arrows at the Orcs with speed and accuracy during the action sequence there's no one better. John Rhys-Davies is disguised well as a 3-foot dwarf, but the camera tricks required to make the tall actor into a short character prevent us from seeing the character fight in his full glory. His tight close-ups have to be used over and over again to avoid recognizing the size differences and thus becomes a visual handicap. Perhaps the most irksome quality of this film, and much of the trilogy as a whole, is Jackson’s inability (at least to this viewer) to make me believe in the emotions of his characters. In The Fellowship of the Ring in particular, Jackson's emotional histrionics are hit so hard he’s forcing us to feel his characters’ pain harder than he needs to. Just look how hard Jackson wrings out the tears shed by the death of Gandalf. After the magnificent Mines of Moria sequence, which has the Grey Wizard sacrificing himself against the impressive Balrog monster, Jackson lingers heavily on the Hobbits' excruciating pain, including the use of slow motion and Howard Shore’s melodramatic swooning. We get this same feeling during Samwise Gamgee’s fitful attempt to chase down Frodo, who has floated away in a boat. Frodo’s dramatic rescue of Sam feels like Jackson again not trusting the investment we have already made in the characters and pulling too hard for emotion where force is not required. Then again, even as I write this, it feels odd to critique so finely a film, which, as mentioned, I admire so much. But then again we can’t just settle to admire a film. To be moved by a film is to have the amalgam of its scenes, sequences, characters, music and special effects be greater than the sum of its parts. 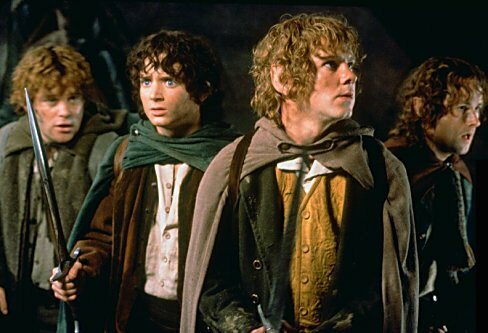 There’s so much in Lord of the Rings: Fellowship of the Ring that in fits and starts there are moments of greatness. But as a whole, it’s just an admirable film. Kieslowski shot the ten Dekalog films back to back as well as the Three Colors. No where near the scale of Lord of the Rings but pretty impressive nonetheless.